You might have thought only shopkeepers live above the shop, but four terraced houses in Bracknell are the offices, workshops and homes of the Austin brothers. 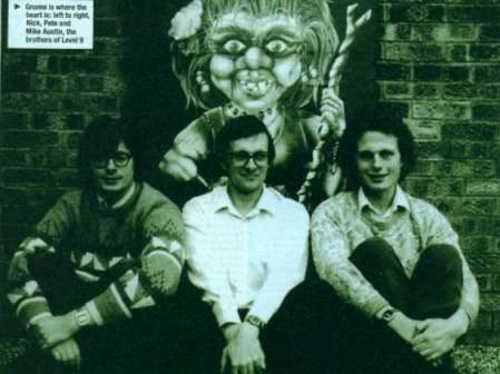 They are Mike, Nick and Pete, and they spend most of their time looking after the shop — Level 9 Computing, the adventure factory responsible for Emerald Isle, Gnome Ranger and now Knight Orc. When I met them in November they had pretty well decided on the games for 1988 and sadly it looks as though the most interesting, a combined arcade/adventure game will not be released for the Spectrum. Though the Austins are keeping the story line a secret, it’s likely to be a game with text — too much text for the Spectrum’s memory. Level 9’s next Spectrum title will appear about Easter, presenting the further adventures of the wonderful Ingrid Bottomlow in a Gnome Ranger II. Pete sees her as a sort of young Norah Batty, so perhaps we’ll see her before her stockings wrinkle. Planned for the end of 1988 is a survival game which will involve problems solved for real by Pete Austin in the great outdoors of Berkshire. This will be text-only on the Spectrum — a great loss, considering the graphics in Gnome Ranger. Level 9 is branching out into the arcade/adventure field but it’s unlikely the Austins will stray much further yet. They see little prospect of the educational-software market growing large enough to be profitable, and for similar reasons they are unlikely to introduce a budget label — particularly as in the 16-bit market their prices start at £14.95, with many costing twice as much. They have, however, recently starts selling in the USA and have gone in at $19.95 (about £11). That’s near the bottom of the price-range there but Pete says ‘we do not intend to sell on the basis of price, but of quality. ‘It’s a bit early to tell how sales are going,’ he continues, ‘but if it carries on at its present rate, half of our of all our sales will be there.’ Four Level 9 tides have already gone on sale in Uncle Sam’s great republic: Silicon Dreams, Jaws Of Darkness, Gnome Ranger and Knight Orc. Commenting on why Level 9’s sales have stayed high in a notoriously fickle market, the Austins explain that they always write the games they most wish to play themselves — and have found, so far, that most others like them too. There was a long silence from Level 9 after Silicon Dream — and then two adventures released in quick succession. Mike explains that the gap of almost a year was largely because all Level 9’s games were being converted and greatly expanded to run on 16-bit machines — mainly the Atari ST, but also the Amiga. Now this has been completed, and the Austins hope to release four to six games in 1988. The Austins are confident their games will win, believing no other programmers offer anywhere near enough pure strategy along with the puzzle-solving. Pete, particularly, believes most other adventures simply aren’t logical enough, and often contain anachronisms (the credibility of a game is lost if you’re in a medieval setting and you find a battery-operated torch, he says, though many players take that as part of the fantasy). Another problem is that the titles of many adventures are so long and weird that people find it embarrassing to ask for them in the shop, says Pete. He thinks this is why The Hobbit still sells so well — it’s a short, simple title which is easy to remember. Celtic names (real or invented) also get the thumbs down, as they are very difficult for most people to pronounce correctly and if spelled in a more English fashion only offend the Welsh or Gaelic speakers. He suggests that ‘what magazines like CRASH should do, rather than ban violent or overly aggressive advertising, is relegate it to the back of the magazine where it’s less obvious’. The perennial argument against that is that many people actually read magazines from back to front. All the Austins dislike the kind of game where characters are violently decapitated and a little gnome comes along and kicks the head off the screen. They hope that these games, which they call ‘vomit games’ after their usual sound effects, are just a passing phase that will disappear as the industry grows up. In their games there is almost no attacking, and in Gnome Ranger the worst that happens to anyone is that the witch gets her wand broken. Even in earlier Level 9 games, where it was sometimes possible to kill characters, they would come back later in the game, as ghosts, and cause more trouble than if you’d left them alone. The Austins would also like to change the way that in so many top-selling games all the effort goes into presentation and graphics, rather than gameplay. They say they’ve always done things the other way round — the important thing has been the puzzle, not just pretty pictures. Going on to explain how they think adventuring will develop, the Austins all agree that there will be much more interaction between player and nonplayer characters (NPCs). The object is to make these NPCs far more real and to construct puzzles which will be impossible to solve without their cooperation. In other words, the adventure will become more like an interactive book. The Austins intend to carry on using graphics — and some movement, such as clouds and rippling water — and more mood music, though they won’t put that on the Speccy.